Weight Loss Surgery > Am I a Candidate? Obesity is the result of excessive accumulation of fat beyond the body's requirements. According to the National Institutes of Health, health problems are associated with weighing 20 percent more than one's ideal body weight. The most accurate way to quantify "obesity" is by associating an individual's weight with his or her height. This relationship is known as body mass index. BMI is calculated by dividing actual body weight (measured in pounds or kilograms) by height (expressed as square meters or square inches). According to the National Heart, Lung and Blood Institute, a BMI between 18.5 and 25 kg/m2 is considered to be within the normal range. Individuals with BMIs between 25 and 29.9 kg/m2 are considered overweight, and those with BMIs between 30 and 39.9 kg/m2 are considered obese. Morbid obesity is defined as body weight greater than 100 pounds above the ideal body weight, BMI of 40 kg/m2 or BMI of 35 kg/m2 when associated with other health problems or co-morbidities. Currently, more than 50 percent of Americans are considered overweight and more than 5 million are considered morbidly obese. Furthermore, childhood obesity is becoming an epidemic in the United States. It would not only be simplistic but probably erroneous to explain obesity as the result of overeating. Medical literature has shown that there are multiple complex factors that contribute to weight gain, including genetic predisposition, environmental factors, lifestyle, psychological factors and specific hormones (leptin and ghrelin). What Are the Dangers of Being Obese? Research has shown that the risk for developing health problems such as heart attack, type 2 diabetes, hypertension and dyslipidemia, sleep apnea, menstrual problems, infertility, urinary stress, gastroesophageal reflux disease and depression increases with a higher BMI. In fact, patients whose weight exceeds twice their ideal body weight have double the risk for an early death compared to non-obese individuals. Obesity has been correlated with increased mortality associated with several cancers, including endometrial (5.4 times), gallbladder (3.6 times) uterine/cervix (2.4 times), prostate (1.3 times) and colorectal (1.7 times) cancer. 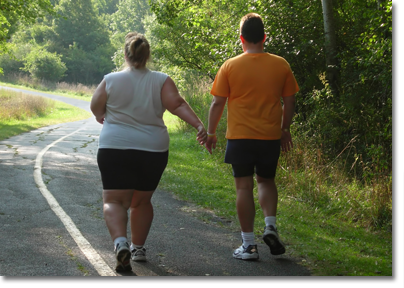 In addition, the social, psychological and economic effects of morbid obesity can be especially devastating for individuals and their families. Fortunately, studies have shown that weight loss can reduce obesity-related health risks. For example, a 10 percent weight reduction results in a 20 percent reduction in the risk for developing coronary heart disease. What Treatments Are Available for Obesity? Currently, several treatment options are available to "fight" obesity. The objective of dieting is to customize caloric intake to individual needs. It is important to realize that reducing calories should be done slowly and methodically. Rapid, unsupervised weight loss is associated with serious detrimental effects to the body such as malnutrition and metabolic disorders. A sedentary lifestyle and lack of exercise are major contributors to obesity. Physical activity is necessary to maintaining weight loss. Regular exercise sets the internal "thermostat" to a higher metabolic steady state, enhancing calorie and fat burning. Thirty minutes or more of daily physical activity is recommended to maintain or control weight. Drug therapy is usually reserved for individuals with a BMI greater than 30 kg/m2 or greater than 27 kg/m2 with co-morbidities (hypertension, dyslipidemia, sleep apnea and type 2 diabetes). To avoid health problems such as malnutrition, any patient participating in a drug therapy regimen must be assessed at regular intervals by a medical team. Currently, the U.S. Food and Drug Administration has approved three drugs for the treatment of obesity: Orlistat (Xenical), Phentermine and Sibutramine (Meridia). These drugs act either by blocking fat absorption or by suppressing appetite. To be effective, drug therapy should be administered in conjunction with lifestyle modifications.